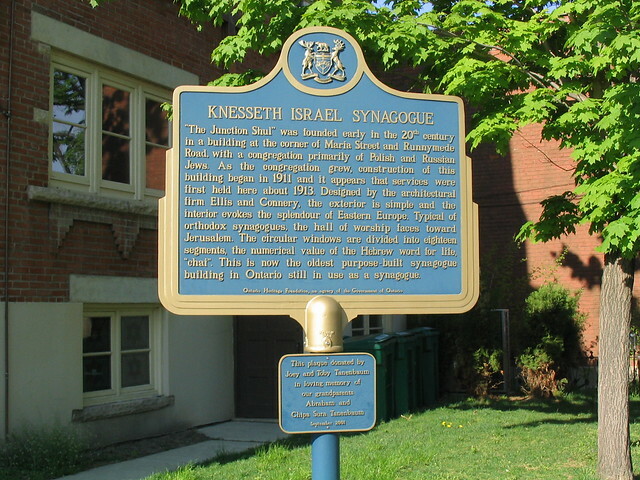 Knesseth Israel Synagogue (also called “The Junction Shul”) at 56 Maria St in the Junction in Toronto just off Dundas St W. The building was built starting in 1911 and is a designated heritage building and also has an Ontario Heritage Foundation plaque. The building dates from a time when the Junction was a key centre of industry for Toronto, drawing many working class immigrants to the plentiful jobs. 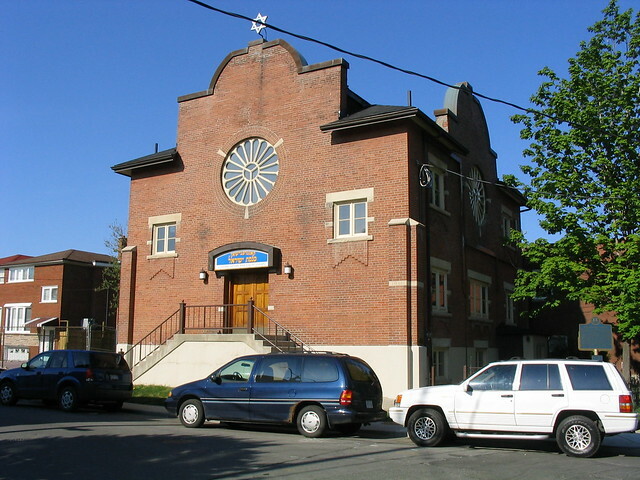 “The Junction Shul” was founded early in the 20th century in a building at the corner of Maria St and Runnymede Rd, with a congregation primarily of Polish and Russian Jews. As the congregation grew, construction of this building began in 1911 and it appears that services were first held here about 1913. Designed by the architectural firm Ellis and Connery, the exterior is simple and the interior evokes the splendour of Eastern Europe. Typical of orthodox synagogues, the hall of worship faces toward Jerusalem. The circular windows are divided into eighteen segments, the numerical value of the Hebrew word for life, “chai”. This is now the oldest purpose-built synagogue building in Ontario still in use as a synagogue.